 “Likewise the deer; also ibexes, avice as it were, those that appear as the birds amidst the hills and hold to heights and live in the acme of the mountains, so that they are rarely open to the human gaze. “From whence they are called bird ibexes in the southern parts, [birds] that live by the Nile river. This animal also, so called, dwells in the high rocks; and if they sense danger by human or by chase, they escape unhurt to the high mountains where they sharpen their own horns beforehand. Now, unfortunately there’s not as much lore in this passage as there’s been in recent weeks. But, there’s at least an implication that deer are revered as quasi-sacred animals since the height of their homes is emphasized. The fact that they also know of the curative properties of wild marjoram (“dittany,” or the Latin “dictamnum”) also suggests that they’ve got a measure of intelligence that goes beyond that of most other animals. Underwriting this implication about deer is Isidore’s use of “ipsi” “self, himself, herself, etc.” in the sentence about dittany being “known to them” (“prodiderunt”). This wording makes it plain that the deer have figured this out on their own. And then there’s the strange mention of the deer’s hissing sounding like panpipes (“fistularum,” or “bagpipes, tubes, panpipes”). Maybe such a high pitched sound is supposed to further highlight the deer’s harmonious state in its natural place. Or maybe it’s supposed to gently disprove pagan belief in satyrs, since there’s a natural explanation within the bounds of Christian creation. Fairly unrelated to all this talk of deer is a discovery made away from the translated page. The word “avices” wasn’t turning anything up in the Collins Gem Latin Dictionary used for reference, so the words around where it should be were poked at. Among these words is “Avernus,” which refers to a lake that was “believed to be an entrance to the lower world” (according to the Dictionary’s definition). It doesn’t seem to be related to the hall of Grendel and Grendel’s mother in Beowulf, but the idea that a lake and not just a cave could lead to the lower world suggests a Roman precedent for the underwater hall of the epic. Undoubtedly there are also precedents in Germanic myth and lore, but this one from the Romans (Virgil uses it as this in the Aeneid) is indeed curious. Perhaps the Romans spread this story amongst the Britons and those living in the Roman-occupied British Isles? Perhaps those stories were then passed around and eventually picked up by a Briton poet or scop ([shaw-op] Old English for “poet”) savvy enough to know that underwater halls were already popular with/known to his new patrons? Tracking that sort of historical progression is tricky – but that’s just what makes it so fascinating. Like that hypothetical scop, Beowulf also minds his words in this week’s passage from the poem as he makes the bulk of his war-boast before at last going into the barrow. Check back on Thursday for it! 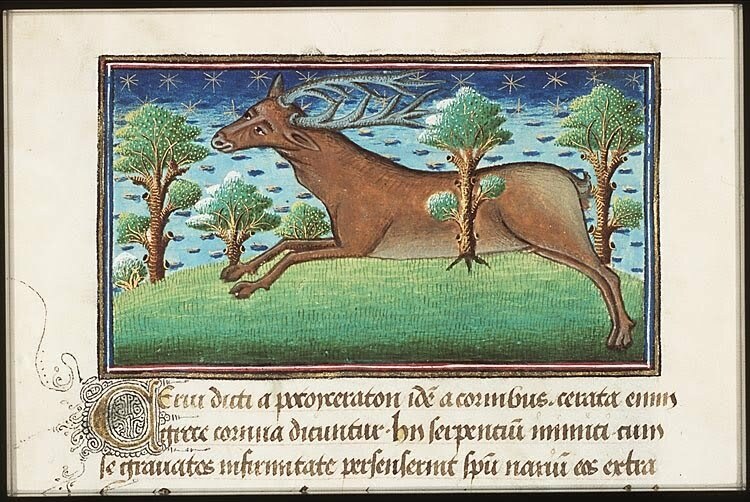 This entry was posted in Latin, prose, translation and tagged animals, deer, Etymologiae, St. Isidore of Seville by NSCZach. Bookmark the permalink.